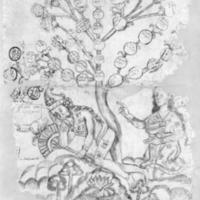 This manuscript painting depicts the family tree of an illustrious Maya family from the Yucatán, in Mexico. It is painted on European paper and shows a central male figure resting on the ground. From his body grows a tree which blossoms with the names of his relatives. At his side, an indigenous woman kneels. The painting once filled a sheet of paper, but now only the central portion remains. The tree derives from a European model, the Tree of Jesse, which was introduced into the Maya region by friars in the 16th century. In European representations of the Tree of Jesse, Jesse sleeps at the base of a tree, with his head resting upon his elbow. This Maya progenitor, Tutul Xiu, mimics the pose of the Christian Jesse, and a tree rises from his loins. He wears a crown resembling the miter headdress of the Aztec rulers of Central Mexico. It may reference the Xiu family’s ties to that region. Tutul Xiu's leg is marked by two tattoos. To the right of the tree, is a woman whose name was lost with the deterioration of the manuscript page. Scholars believe she is the wife of Tutul Xiu, and herself of Maya ancestry. Above them, along each branch and in the tree’s blossoms appear the names of Xiu descendants. In the shallow bowl in the foreground there are two deer legs, crossed and aflame. They appear here before an entrance to a cave and thus refer to pre-Hispanic Maya rites for commemorating and honoring ancestors. The image was created by Gaspar Antonio Chi, a Maya man trained by Franciscan friars in their school in Maní, Yucatán. Chi came from one of the most powerful indigenous families in the region: the Xiu family had strong pre-Hispanic claims to both land and leadership. As an educated elite Maya man, Chi knew how to write and speak not only Yucatec Maya but also Spanish, Latin and Nahuatl, the indigenous lingua franca of central Mexico. This image seems to have been created in two stages, by at least two different hands. The earlier portion, which dates to ca. 1560, includes the majority of the image. The additions of ca. 1685 involve several cartouches with writing at the far left of the scene. The image is painted with black ink upon European paper. This painting is part of a larger set of colonial documents, including historical accounts, land titles and petitions to colonial officials kept in a leather portfolio and called the Xiu Chronicles. The Chronicles were formed, piecemeal, between the mid-16th century and the early 19th century. Its texts addressed both the Spanish Crown and the Xiu family, who owned them, documenting their ancestry, history of service and claims to land. Today the collection is held by Harvard University in Cambridge, Massachusetts. This painting suggests how European traditions—both of ancestral history and pictorial representation—could be appropriated by indigenous people in the 16th century and reworked to accommodate local histories. The painting is in many ways an amalgam of Maya, Nahua and European traditions, replicating no single tradition. The scene is thus an invention that recasts indigenous and European conventions into imager deemed (by Gaspar Chi) to be more fitting of colonial conditions. The Xiu Family Tree thus makes clear both the complexity of indigenous history before and after the Spanish conquest and the importance that ancestral connections continued to hold for indigenous communities, European-born friars, and colonial officials alike. Reproduced courtesy of Special Collections, Tozzer Library of Harvard College Library. Carrasco Pizana, Pedro. 1982. Sobre los indios de Guatemala. Guatemala: Editorial José de Pineda Ibarra, Ministerio de Educación. Cortez, Connie. 2002. “New Dance, Old Xius: The ‘Xiu Family Tree’ and Maya Cultural Continuities after European Contact.” In Heart of Creation: The Mesoamerican World and the Legacy of Linda Schele. Andrea Stone, ed. Pp. 201-215. Tuscaloosa and London: University of Alabama Press. Restall, Matthew. 2000-2001. “The People of the Patio: Ethnohistorical Evidence of Yucatec Maya Royal Courts.” Royal Courts of the Ancient Maya. Takeshi Inomata and Stephen D. Houston, eds. Pp. 335-390. Boulder: Westview Press.